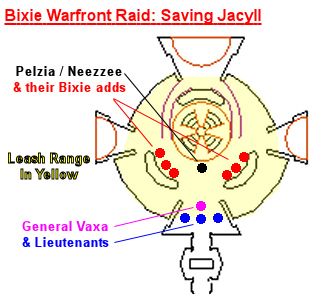 This raid expedition begins with Frislo (click for map image) in the Bixie Warfront. - Completed Ethernere Tainted West Karana raid "The Doomscale Horde"
- When the event is triggered, mobs will spawn in the center of the ground floor of the hive, so you'll want your raid in position and ready for this to happen. - To trigger the event, hail Frislo, and then destroy the glass wall that houses Jacyll at the top of the hive. --- This spawns the first wave of three total waves. - Mob waves spawn one right after the other and auto-aggro on anyone in the event room (there is no break between waves). - There is no known wave timer. Subsequent waves spawn upon the death of the last mob in the previous wave. - First wave: 1x "Pelzia the Crazed" + 6x "a bixie battlemaster"
------ Wing Bash: 500' range AE knockback + nuke for 13,300 dmg (not avoidable). ------ Stinging Blade: 20' range frontal stun + nuke for 46,500 dmg (avoidable out of line of sight). ------ Pollen Cloud: 30' range random targeted AE DOT for 26,600 dmg/tick + melee disc silence + spell slow (one-hour duration). - Second wave: 1x "Warchanter Neezzee" + 3x "a bixie compeller" + 3x "a bixie enthraller". ------ Spinning Blade: 50' range AE spinstun + nuke for 55,300 dmg. ------ Chaotic Rune: Buff with rune + melee damage shield for 8,600. ------ Chaotic Feedback: Single target retaliation for 26,600 + mana drain for 8,000 mana (if cast upon with rune up). ------ Hush: random single-target melee+spell silence. ------ Mind Sap: random single-target endurance/mana drain. ------ Tranquil Slumber: random single-target one-tick mez. - Third wave: 1x "General Vaxa" + 1x "Lieutenant Drix" + 1x "Lieutenant Zizzix" + 1x "Lieutenant Vyzik"
------ Hive Mind: Buff for 5,000,000 regen per tick (one-hour duration). ------ Venomous Sting: random single-target lure + DOT for 19,900 dmg per tick (one-hour duration). ------ At 75%: either 6x "a bixie battlemaster" or a random mix of "a bixie compeller" and "a bixie enthraller". ------ At 50%: either 6x "a bixie battlemaster" or a random mix of "a bixie compeller" and "a bixie enthraller". ------ At 25%: either 6x "a bixie battlemaster" or a random mix of "a bixie compeller" and "a bixie enthraller". --------- Adds have the same abilities as in their previous appearances. --------- It isn't necessary to kill adds for the event win (any adds remaining after the General and all three Lieutenants are dead will despawn). - After the event is triggered, a drum (clickable object on the ground) activates next to Jacyll's location. --- After a player clicks on the drum, the player receives a debuff called "Weakness" which prevents them from clicking the drum again for 2 minutes. --- After the drum is clicked (by anyone of any class), no one else can click the drum until 10 seconds have passed. --- Each class arch type has both a benefit and a penalty for playing the drum. --- Silences mob casting (only works on "a bixie _____" mobs). --- Increases mob melee output. --- Cures entire raid of certain debuffs (applies only to Pelzia's "Pollen Cloud" and the final wave's "Venomous Sting"). --- Casts a short-term stun on entire raid. --- Gives bixies a high rate of melee avoidance. --- Removes the high rate of bixies' melee avoidance triggered by priest drum clicks. --- Causes mobs to cast their spell attacks more frequently. --- Dispells certain NPC buffs (applies only to Neezzee's "Chaotic Rune" and the final wave's "Hive Mind"). --- Dispells one random buff from all players in the zone. - Kill the three waves to complete the event. 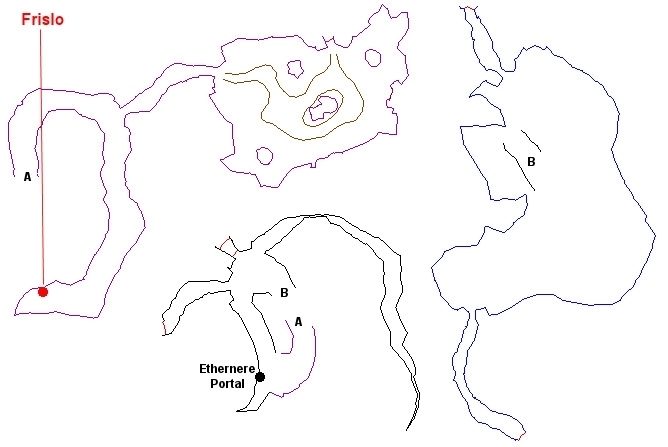 This is a map of the hive's main floor, with the entrance being the south doorway. Note that healers can use the alcoves to hide out of line-of-sight, which will prevent some (not all) AE spells from landing. The chamber that houses Jacyll, "a glass wall" is attackable. When ready to trigger the event, destroy the wall. As the music stops, the hive begins to stir. At this time, a clickable drum appears in Jacyll's chamber, and "Pelzia the Crazed" + 6x "a bixie battlemaster" spawn on the hive's ground floor. _____ beats on the drum. After a player clicks on the drum, the player receives a debuff called "Weakness" which prevents the player from clicking the drum for 2 minutes. After the drum is clicked (by anyone of any class), no one else can click the drum until 10 seconds have passed. Each class arch type has both a benefit and a penalty for playing the drum. A pure caster (enchanter, magician, necromancer, wizard) drum click silences mob casting (only works on "a bixie _____" mobs), but increases the damage output of mob melee DPS. A priest (cleric, druid, shaman) drum click cures entire raid of certain debuffs (applies only to Pelzia's "Pollen Cloud" and the final wave's "Venomous Sting"), but triggers a one-second stun on the entire raid and gives all non-named bixies a very high rate of melee avoidance. A pure melee (berserker, monk, rogue, warrior) drum click removes the high rate of melee avoidance triggered by priest drum clicks, but causes mobs to cast their spell attacks more frequently. A hybrid (bard, beastlord, paladin, ranger, shadowknight) drum click dispells certain NPC buffs (applies only to Neezzee's "Chaotic Rune" and the final wave's "Hive Mind"), but also dispells one random buff from all players in the zone. The drum doesn't have to be played at all, or with any consistency, but ignoring its mechanic entirely would make the event unbeatable. Note: Bixie battlemasters are highly avoidant of melee damage. Note that drum click penalties occur with each click (see the section above for details). - Priest clicks will cure the entire raid of Pelzia's "Pollen Cloud", but make battlemasters highly avoidant to melee DPS. - Melee clicks will remove the high rate of avoidance to melee from bixie battlemasters. - Caster clicks will prevent bixie battlemasters from casting their "Stinging Blade" AE. - Hybrid clicks have no known use for this wave. - Melee clicks have no known use for this wave. - Priest clicks have no known use for this wave. - Caster clicks will prevent bixie adds from casting their mezzes, silences, and mana drains. - Hybrid clicks will dispell Warchanter Neezzee's rune/damage shield. General Vaxa hits for a max ~45,000; summons after 98% health; single-target rampages; flurries; and AE rampages. Vaxa's Lieutenants each hit for a max ~35,000 (no rampage; no flurry) and summon after 98% health. General Vaxa begins to summon the hive for help. There is a 5-6 second delay between the spawn emote and the actual appearance of the adds. Unlike when you encountered these adds earlier in the task, these versions only hit for a max ~15,000. They do, however, have the same spell and defensive abilities as when they previously appeared in the event. - Priest clicks will cure the entire raid of "Venomous Sting", but give Lieutenants and any bixie adds a very high rate of melee DPS avoidance. - Melee clicks remove the high rate of melee avoidance caused by priest clicks. - Hybrid clicks will dispell mobs of "Hive Mind". If any NPCs are left idle for anymore than 30-60 seconds (inexact timer), everything despawns, all players and corpses warp to the hive entrance, and the glass wall respawns at the top of the hive. General Vaxa has been slain by _____! Jacyll rubs his head while struggling to remain balanced, but otherwise appears to be ok.
"a treasure chest" spawns on the ground floor of the hive. 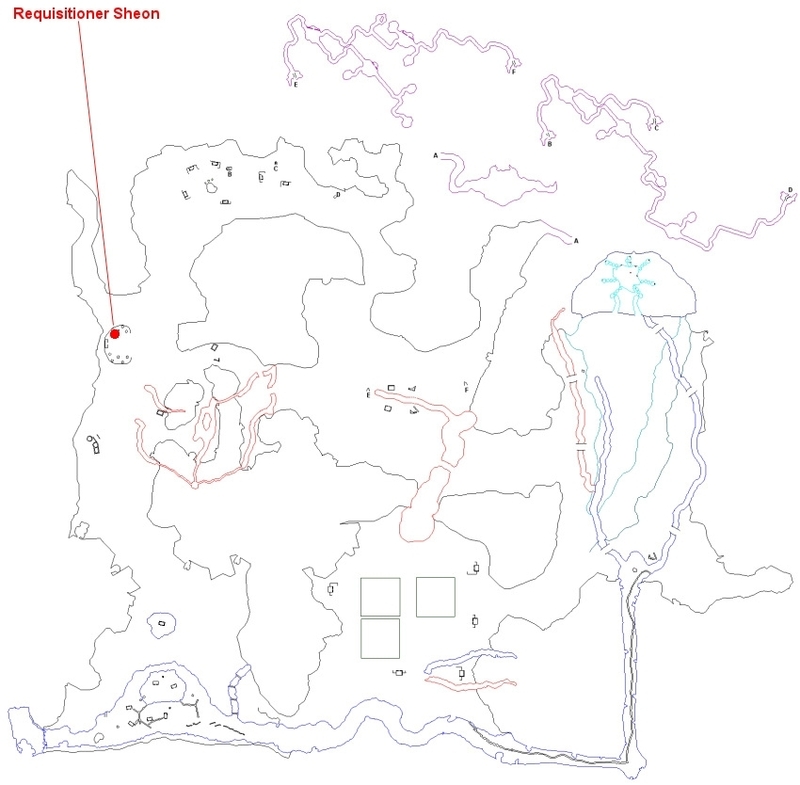 NOTE: In addition to chest loot, everyone in the zone receives 10x "Medal of Heroism" (used as an alternative way obtain raid drops, from Requisitioner Sheon (map image), the Tier 1 raid vendor in the northwestern Qeynos camp of the Ethernere Tainted West Karana).